It’s hard to read my blog yet not know I’m using Emacs. It really is a great tool and has a lot to compare to PostgreSQL in terms of extensibility, documentation quality and community. 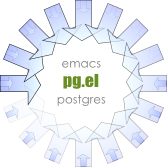 And there’s even a native implementation of the PostgreSQL Protocol written in Emacs Lisp. One of the things where Emacs really shines is that interactive development environment you get when working on some Emacs Lisp code.